Palestinians Stand Up to Israel, Will the World? Mariam Barghouti is a Palestinian American writer currently residing in Ramallah. She documents and writes on the Palestinian situation and Israeli occupation. Her writing and analysis has been featured in the NYT, Huffington Post, al-Jazeera and others. AARON MATÉ: It’s The Real News, I’m Aaron Maté. Palestinian protests continue over President Trump’s recognition of Jerusalem as the capital of Israel. Israeli forces have cracked down across the occupied territories, killing at least four people and wounding hundreds more. Joining me from Ramallah is Mariam Barghouti, Palestinian American writer who covers Palestine and the Israeli occupation. Welcome Mariam. What have you been witnessing over the past few days? MARIAM BARGHOUTI: Over the past few days, Palestinians have been protesting in the street against the latest Trump recognition of Jerusalem as the capital of Israel. We have seen youth in various segments of Palestinian society go to the streets, perform acts of civil disobedience such as mass strike across the West Bank and within Jerusalem, and…Palestine, historic Palestine. AARON MATÉ: What has been the Israeli response? There have been some images coming out of Israeli forces cracking down on Palestinian children, firing tear gas. What kind of tactics have the Israeli forces been using? MARIAM BARGHOUTI: Well, the tactics that the Israeli forces have been using is nothing unusual for Palestinians. They’ve been coming at us with the usual excessive tear gas used against protesters, shooting plastic coated steel bullets, shooting live ammunition injuring over 2000 Palestinians throughout the West Bank, Gaza and historic Palestine as well. So, the tactics they’re using are not new. In fact, they’ve been using them against Palestinians for decades. AARON MATÉ: How do the protests get organized among Palestinians? Are there meetings? Is it even possible to organize under the conditions of occupation? MARIAM BARGHOUTI: It’s not exactly impossible to organize. There are specific central points where protests occasionally happen in Palestine. You have the checkpoints that Palestinians have been protesting for years, you have Damascus Gate in Jerusalem that has been a centralized location for mobilization. In Gaza, you have near the buffer zone where protestors go and mobilize there, as well. It’s not exactly one strategy. Rather, it is knowledge amongst Palestinians of where the confrontation points occur. 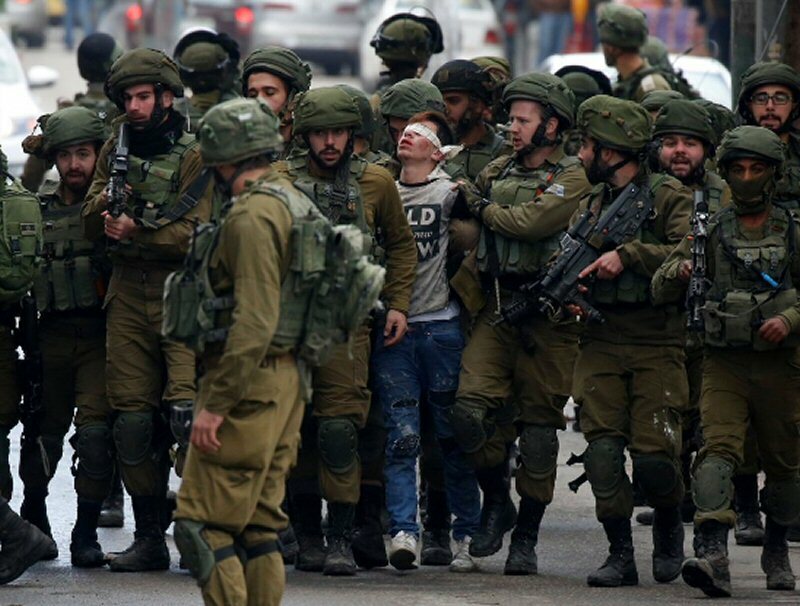 AARON MATÉ: One of the most viral photographs so far from the protests has been that of Fawzi al-Junaidi, 16 years old, blindfolded by the Israeli forces and taken away. He’s now facing charges. Can you talk about his case? MARIAM BARGHOUTI: Well, of course he’s going to be facing charges by the Israeli Military Court who accustomly takes Palestinian youth and throws charges at them, whether it’s stone throwing or illegal protesting. You have a 99.7 conviction rate against Palestinians. You’ve had the idea, apologize for their soldiers stealing fruit during a protest but at the same time not saying anything when they are violently suppressing Palestinians and arresting young people like al-Junaidi. AARON MATÉ: Right. Can you talk about that? The IDF put out a press statement saying that it had disciplined a soldier for stealing fruit from a fruit stand in the West Bank. How was that received in the occupied territories? MARIAM BARGHOUTI: Of course it was mocked because what it essentially shows, however, is how much Israel dehumanizes Palestinians and how little value they give for Palestine lives, that they felt the need to send out a relationship apologizing for the behavior of a soldier that stole fruit. But at the same time, you have Israeli settlers stealing Palestinian homes, kicking Palestinians out of their houses, their lands and soldiers violently suppressing, beating Palestinians, arresting Palestinians, charging them in the military courts but they felt that it was more important to speak out about stealing essentially fruit. AARON MATÉ: Palestinian Authority President, Mahmoud Abbas, he has criticized the US, saying that Palestinians will no longer consider the US a partner in the so-called peace process. Do you take that seriously? MARIAM BARGHOUTI: The US has never really been a partner in the peace process. It’s been constantly aligned with Israeli interests. It’s the Palestinian Authority’s failure to recognize that nothing is going to come out of these negotiations because the demands of Palestinians are not taken seriously. Nothing is being implemented on the ground. It’s all been fruitless talks at the expense of the Palestinian population. AARON MATÉ: Do you think then that the Palestinian struggle for freedom can move forward with people like Abbas and his circle in power? MARIAM BARGHOUTI: Absolutely not. I mean, they had their chance for more than 25 years. What they brought the Palestinian people is the Oslo Courts that have further compromised our rights and our dignity and turned the Palestinian Authority into a subcontractor of the occupation, making it the cheapest occupation. As a result, they have no space in the Palestinian struggle because the Palestinian Authority’s interests do not align with that of the Palestinians. AARON MATÉ: Finally, the fact that the Palestinians are not just under a military occupation, not just in the West Bank carved up by settlement blocks, but also territorially the West Bank and Gaza are totally cut off from each other. How hard is it for a Palestinian movement to develop under these conditions? MARIAM BARGHOUTI: Well, it’s not just the West Bank and Gaza. You have Palestinians completely divided between Palestinians with Jerusalem ID, Palestinians with Israeli citizenship. You have almost 50% of the Palestinian population in the diaspora, so it’s not just being cut off from Gaza. This is a divide and conquer strategy and it’s a colonial strategy that has been used in the past and is being used against Palestinians.It makes it difficult because what it essentially does is also divide Palestinian identity. It makes Palestinians think that one suffering is different than the other, when it’s all under this umbrella of occupation and colonialism. It makes it difficult to further connect, to relate, to network with one another. AARON MATÉ: But yet, do you see the fact that protests like these are continuing and they’re the latest in a long history of organized resistance to the occupation. Do you see encouraging signs? MARIAM BARGHOUTI: Well, here’s the thing, is many people in the media are portraying this as something new. Palestinians have been protesting for decades and they will continue to protest as long as they’re not liberated. They will continue to speak out against it. The question is when will the rest of the world finally begin listening to these voices on the ground? AARON MATÉ: Mariam Barghouti, Palestinian American writer, speaking to us from Ramallah. Thank you.